Lavender is such a lovely color. It's feminine and chic without being overly sweet which makes it kind of perfect across seasons. It's somewhat subdued so it's also easier to wear than radiant orchid. I think it looks really sophisticated paired with burgundy and shades of grey and so fresh when coupled with mint. Are you a fan of lavender? What shades do you like to pair with it? The dress so elegant and chic great collage doll. 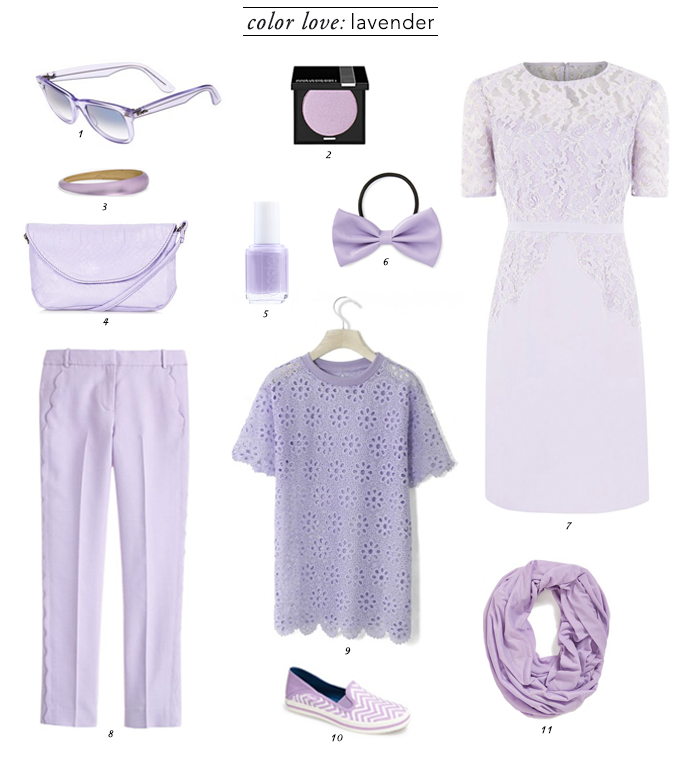 Lavender is a very cute color, and I dig it in that eyelet top. But I'm also really loving eyelet right now anyway. I am TOTALLY getting the lavender polish! Love Essie and this color is awesome. I don't do a lot of color with my clothing so nails are a fun way to incorporate color trends. Lovely layout! This set pulled on my heartstrings, love this girly shade, that dress is divine! Lavender is such a pretty color (definitely more to my liking than radiant orchid). That dress is so so pretty and I love the nail polish as well. This is such a pretty color isnt it! I really love lavender especially for Spring! such a great color! loved the way you introduced it. it's so true- very feminine without being overly sweet! It is you are right! And that dress oh my! Not sure if I can afford that but I can afford the eye shadow and the nail polish. Nice! I agree with you! It's one of my favorites from the pastel family. I've been wanting to get a lavender nail polish lately! I love this color, perfect for spring!!! I am loving those scalloped pants. I think this is one of the best pastel color for spring! Wowww I love this color! It's so wonderful and chic. Ah, this post has calmed my heart!! I love lavender..the color and the flower! Funny enough, though, I never wear this color! I love seeing this color more and more in stores lately (along with other pretty pastels!) so hopefully I can incorporate it more :) That lace shirt is so so pretty! Stunning picks sweetie! I love this post! I never really liked violet colours until I saw this post! The Essie polish looks lovely and all these pieces of clothing you've put together look like an absolute treat for summer. I think they would look lovely in the Autumn too with all the leaves below your feet. That dress is so gorgeous and would be lovely for a formal occasion - invite me to an opera, please! Have a good week, dear Rowena!! 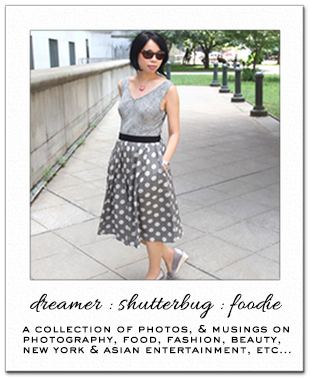 my like in bloglovin for your post!!! Such a gorgeous color! Will have to shop this color soon! I don't have any item in this color, but I love lavender aroma. Love the colour! The sunnies are so gorgeous. all the items look so amazing dear! I absolutely adore lavender! It is the perfect color for spring! What a lovely post and a beautiful selection. I've always been a fan of lavender especially for spring. The lace overlay dress is so pretty and I think I may just treat myself to the Essie polish! Lavendar is such a pretty color. I love the adorable scallops on those pants. I love lavender, it's so ethereal! Yay for lavender, I've been wearing lots of it lately. Lavender is such a pretty color but I haven't worn it in years. I need to look for something lavender. Actually, this reminds me of my teen years, I had a pair off lavender jeans I loved, loved, loved. Visiting from SITS. Have a great weekend. Omg Lavender is my favourite colour, all these items are sooo pretty! I can't get over how gorgeous that Essie nail polish and floral top is~ Thanks for sharing this ! I love lavender too...and am totally rocking that nail polish now! I'm not a big lavender-wearer but that polish has my name all over it! Essie has such great shades. I love the lavender colored items! I have a few in my wardrobe already, but I wouldn't mind adding the dress and the top to my collection! I love lavander it is such a beautiful color! !